We're a non-profit organisation that visits hundreds of schools and colleges each year to deliver sessions and interactive training to inspire, engage and inform 1,000s of young people on the benefits of going to university. Our USP as an NCOP delivery partner is to run sessions which grab young people's attention, in a funny and inspiring way. ​Click here to find our more. Push are eager to support all NCOPs in their specific regions by enhancing their initiatives through our unique approach. Our USP as an NCOP delivery partner is to run sessions which grab young people's attention, in a funny and inspiring way. Through our unique approach, we are able to effectively engage with a wide range of students, particularly those who initially seemed the least interested. ​As with all our outreach, we get students both thinking about and discussing what they want from life, what's best for them and how they can get it. Push delivers impartial and independent careers education to all students, which effectively fulfils Ofsted and DfE requirements. We also have a National Careers Award for working with young people, and have over 25 years of experience in delivering outreach. We have presenters located across the country. Our speakers are all trained to Push's high standard, and creating an engaging and lively atmosphere comes naturally to them. ​Our sessions can last anything from an hour to a whole day - in schools, college or even external HE and careers events. "I just wanted to pass on some feedback from our Force session. Push were fantastic - delivered their messages clearly in a very fun and engaging manner. The students were raving about it afterwards and it was an excellent warm-up for our careers fair." What Does Push Do for NCOPs? ​We’re extremely proud of the impact we’ve had with the NCOPs we've worked with so far. We’d love to continue helping as many students across the country as possible, by raising young people's aspirations and inspiring them to make the most informed choices. Achieving this collaboratively is a particularly wonderful (and very powerful) thing. "COME BACK. Really funny and inspirational"
"100% come back! Amazing presentation! Great atmosphere, and enthusiasm, love it!" "Such a good talk: very inspirational, knows how to act depending on the audience. So so funny, which helped to make us interested. Loved it!" "Really enjoyed the session. Told me some stuff that I didn't know before. I also enjoyed the jokes"
"Great to see someone getting us actively involved in our future! Funny and relatable too." 'This was the only careers talk that has ever been engaging to me! Amazing"
"I have now learnt more about what my future could hold"
Click here for details of how we worked with some of these NCOPS. "I usually get bored through assemblies and start talking to people around me, but I did not say a word for the whole hour! You had my attention the whole time. I am definitely considering further education now thanks to you, as before it never crossed my mind"
​"Thank you for taking the time to come and speak to us today, I really appreciate it. I now see everything from a different perspective and feel a lot more motivated. You really made an impact! Hope you can come again"
​"I'm so happy you came to see us, you really helped me have a clearer understanding of what I would want to go for in life after school"
"I just had to let you know that us being the year 9 we are, not knowing what to do and just watching life pass by, really needed to be inspired and motivated and just you talking for an hour made us realise that we need to get going, we'll remember it don't worry." ​"I wanted to thank you for coming to the St Lawrence Academy and giving us, year 11 students, a better view of our life choices. You have really inspired and motivated not only me but many people too. Wish to see you again because your speech as amazing and I usually hate assemblies but your one was my favourite! Thank you so much! ​"It made it 10 times better with the level of relatableness and the fact that everything you were saying, we actually listened to"
​"You were such an inspiration to all of us, thank you so much for coming"
​"Your assembly was absolutely amazing and I'm gonna learn from it"
​"I hope you can come in again and give another inspiring talk before we leave as more people like me will benefit"
“Can I just say you was really good today, with the lecture you gave to the Y11's. Usually we all walk out complaining about a waste of time, this time everyone was so happy and looked like they enjoyed their time. Thank you and we all hope PUSH come back soon"
​"Hi, I'm one of the students in yr9s and I just wanted to say a big thank you for coming in to the school and talking to us. I know you're getting a lot of these messages from other students but I wanted to say it as well! PUSH were brilliant and the favourite part of the whole day for me and many of us! I hope you can come back in one day and inspire us in your funny and beautiful way!" "Like everyone else I'd just like to let you know that...wow! You have inspired a whole lot of us today and I'd like to thank you for that :) Definately made me think and consider a few things which will certainly be very handy dandy. ALSO...your humour is amazing - absolutely the best person we've had come in to talk to us about real life stuff. Anyway, thank you for today, your session was brilliant. I certainly enjoyed every minute, even with my arms folded! We all hope to see you again soon. Farewell for now." ​"We absolutely loved our PUSH TALKS today, and it was the most amazing, inspiring talk, we hope to see Moj again soon at TSLA"
"Thank you so much for coming to our school on Wednesday, I really enjoyed it, you're so inspiring!! You've definitely put a positive impact on my life and the way I view things...thank you for making not just me but the whole of Year 11 laugh at such a stressful time. Keep doing what you do!!" In 2017 Push was proud to host Future Talks - an annual event for students across Plymouth featuring an array of inspirational and motivational speakers. The theme this year was 'Hopes and Dreams'. This was in proud collaboration with Next Steps South West, the National Collaborative Outreach Programme (NCOP) consortia for Devon, Cornwall and Somerset. Above is a 27 minute snippet, if you'd rather just see the highlights click here. "It was really good but even better when we were told what we need to start thinking about and what we need more of"
"A very fun way of learning. Very helpful"
"Fun and a good way of getting points across"
Push have already proudly supported 1,000s of young people in association with Force Higher. We have achieved this through a host of inspiring and informative careers education presentations and workshops, designed specifically for Year 9-13 students. These help raise students' aspirations, make an informed post-18 choice, and encourage pathways into higher education for those who may not have previously considered it. With FORCE we have successfully achieved this inspirational student engagement at 25 different schools and colleges. This followed on from visits with 45 schools and colleges from when FORCE worked as a NNCO. ​Over 85% of students across all these sessions rated our sessions 5/5 or 4/5 with over 80% stating that they felt better informed thanks to Push. Check out an example of one of our recent employability sessions from the FORCE campaign, delivered by one of our presenters, Moj Taylor. We have a full version, as well as a 15 minute version available for your convenience. With FORCE, we delivered talks on Choosing a Uni, Why Go to Uni, Options at 18 and Employability. These covered a range of areas of personal and professional development, and provide a model that can be easily adapted. "Push presented to our year 12 cohort in January 2018. Given their normal diet of external speakers, they may have been forgiven for a lack of exuberance coming into the assembly, however how this changed. Push delivered an inspirational talk in a manner that relates to the students and that was engaging, informative and amusing in equal measure! On speaking to the students afterwards, they were all very complimentary both about the method of delivery and the message they received. Push also very promptly followed up the delivery with an e-mail to the students outlining the different methods of support available . I am already booking them in for the next talk and cannot recommend them highly enough." ​Since September 2017, Push have collaborated with Next Steps South West on a number of different activities. The school and Next Steps South West trusted Push to kickstart the journey through sixth form for their new year 12s. We provided a funny and interactive session designed to help students consider what they want from life and how they might achieve – this is done by making informed decisions and taking proactive steps over the next few years, both inside and outside the classroom. The session, as all our workshops are, was tailored to exactly what the students needed at this stage in their personal and professional development. We incorporated the Next Steps team into our event by devoting the final hour of the session to student questions. The task we set year 12 students was to write a question on something that worried them about their choices, over a 15 minute break, ready to ask during the final part. We had an amazing array of questions. The blended approach to advice, involving both the Push presenter and the local NCOP delegates proved to be incredibly impactful and inspiring for the 65 students who attended, based on the feedback we took from every student (in the way of a Next Steps South West evaluation form). The speech about choices was good, perfect, inspiring, funny. Next Steps South West approached Push over the summer about how we could excite and inspire NCOP target students. These students were from Cornwall, and had been invited to attend an all-day event at the Eden Project. 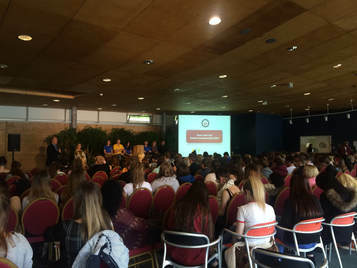 This involved various activities to inform students in the region about the range of higher education options available (and to dispel myths around degrees, university and student finance). The day was launched by higher education representatives from Truro & Penwith College and Cornwall College Newquay. Then introduced were Push presenters Moj Taylor (award-winning actor and comedian) and Katie Lyons (writer and feature film actress, as well as runner of 'Ladders', an activity created for year 8s and 9s visiting Goldsmiths University of London). Both presenters expressed to the students how they were the first to go to university in their respective families. They ran an interactive 90 minute Push workshop on how to explore careers, make work not feel like work, and how higher education can be a pathway to personal and professional success. The day then consisted of career stall speed-dating after lunch, followed by another Q&A activity set by Push. This included an activity where all students who had been encouraged over their break to write a question anonymously on a piece of blank paper handed their queries in. They were asked to place their paper in buckets (used from a previous Push game) to be pulled out on-the-spot and answered one by one. This was achieved through a Q&A with a panel of student ambassadors (all studying in the region, and on different courses). Push led the Q&A, with Moj retrieving questions from the bucket, Katie choosing an ambassador to answer the question, and both presenters adding their expertise on each topic discussed. Students said they found this incredibly useful, and we were able to provide the Next Steps South West evaluation and engagement delegates with all the questions from the day. ​This was a great way to get inside the students' heads and see what worries them about higher education.